Oh my gosh we have done so much in the first 30 days it is hard to keep it all straight. It's a good thing Nancy has been keeping a written journal and recording in it each night otherwise we would never be able to remember what all we have done. This post started out to be the last installment but it is turning out to be way to long so there will be a part four - if this is to long to read just look at the pictures! 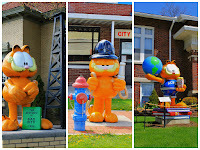 We left Brookville, IN on April 16th and headed to Peru, IN which is north of Indianapolis. Peru, is the Circus Capitol of the World. We stayed at Mississinewa Reserve which is in the Miami State Park. Our RV camping book calls it Mississinewa Lake State Park, but it is really Miami, which is what all the signs say so we had a hard time figuring out where we were going, but the very helpful person at the camp office got us to our site. Started setting up camp and discovered that the electrical cord the dealer sold us to adjust the electrical amps was the wrong one. Google to the rescue - found an ACE Hardware in town and they saved the day by having the correct one. We had electricity but no water as a crew had been working in the camp that day and broke the water main, they got it fixed the next morning so we were good to go for a few days, then a transformer blew and we didn't have electricity for awhile. Our first full day started out foggy and slow, the only plan was to head into Peru and see what they had to offer. Found the Aroma Coffee Shop, which shares a door with the Deroziers Bakery, two of our favorite things! The owner shared some of her favorite places to go, one is the Mississinewa Dam and Lake, so we headed there next and the Seven Pillars. She also told us about the Circus Hall of Fame and why Peru is the circus capitol. It is where all the circuses come together to spend the winter because it is where the trains connect. When her grandfather was a young boy, him and his buddies would go the the circus camp and ride the trick horses and try to figure out how to make them do tricks. We heard a number of similar stories all over town. but cool objects, rather alien looking.The structure is metal and the tubes are very hard rubber. Not sure what they are and not sure we want to know. Eating and drinking is always one of our favorite things to do. 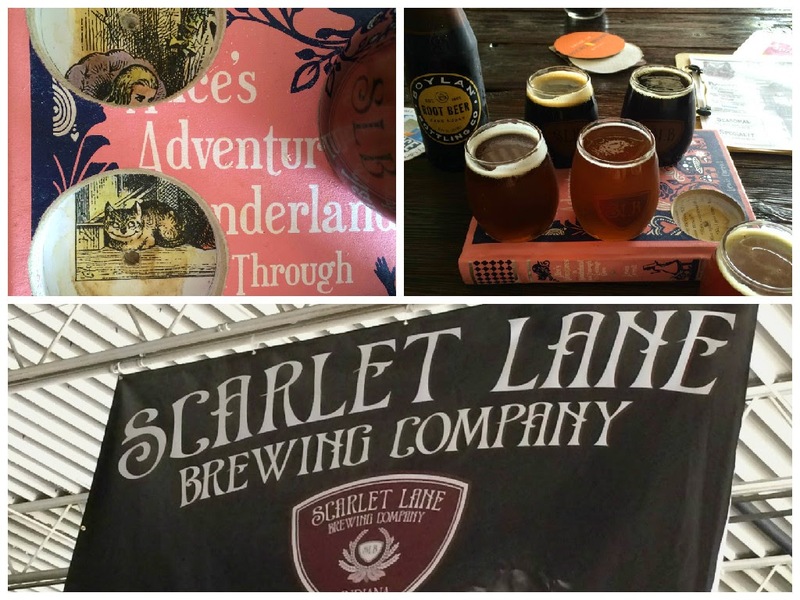 The following are some of the places we tried out. 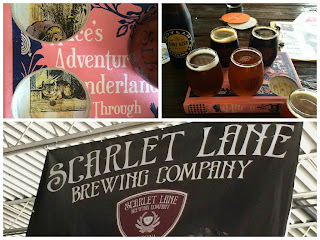 Scarlet Lane Brewery in McCordsville is fairly new, it is in an old warehouse with the tasting area in a small front corner, making it rather cozy in such a big open space. We ended up here because while searching the internet for breweries Nancy found that they brew a beer called Katrina - so of course we had to go. Unfortunately they only brew that beer in the fall, but they did have five others on tap. Nancy got a flight of all five, which were very good, and Les had one of their root-beers. They have the coolest flight trays, they are old books glued together with holes drilled in them to hold the glasses. Reminded us of the ones we made for Katrina and Steve's wedding. The book Nancy got was Alice in Wonderland. While there we ran into a women who is also a Reiki Practitioner and she grew up in Farmington Hills, MI. It really is a small world sometimes. Ivanhoe's - A Huff Post article called The One Thing To Do In Every State claims that Ivanhoe's in Upland is the place to go - we tried on a Saturday and it was so busy we could hardly drive through the parking lot, so went back on Monday and it was much better. Food is pretty basic but very good and they have 100 shakes and 100 sundaes to choose from. So of course we got sundaes. Gabriel's Pancake House is in downtown Peru and we had breakfast there twice. They have really good corned beef hash, Les wasn't super excited about the French Toast but did enjoy the pancakes. We also got a recommendation from our waitress for a hair salon for Nancy, which lead us to the Wabash Donut Shoppe, in of course, Wabash. After Nancy's haircut at the Uptown Salon, we stopped for coffee. They have great donuts and according to Nancy the best Apple Fritters EVER. 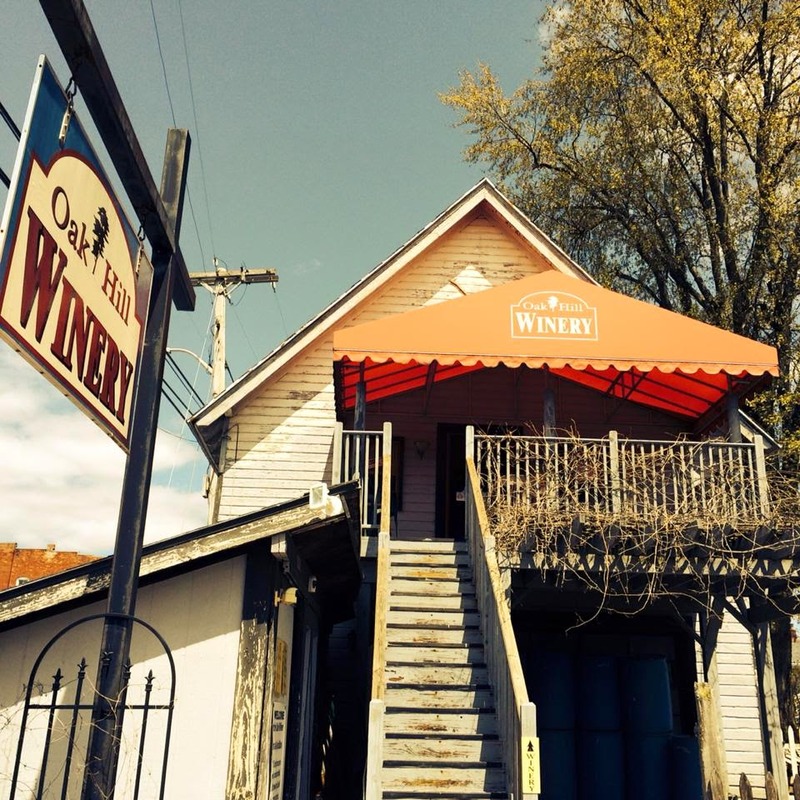 On our road trip to see all of the Garfield statues (pictures to follow later) we happened upon the Oak Hill Winery in Converse. It is in an old house, with the winery downstairs and the tasting room upstairs. Super cute place with lots of little sitting areas and a tasting bar. Nancy tried a number of their red wines and of course we came home with a couple of bottles and one of port as well. One other place we ate at was Harvey Hinklemeyers, don't you love that name? This was extra special as we shared not only our 35th anniversary but a meal as well with Mike and Dawn Berry, We have know Mike and Dawn for a number of years now, they are Nigel's parents and we have spent a lot of time with them at Nigel and Tina's house but never have had an opportunity to just sit and chat and get to know each other. What a treat this was. We got to spend an extra night with them when they came to see our RV and share a meal with us. We are searching out places that have meaning to us for one reason or another, where we were born, cities we lived in, names of family and friends. We discovered an Akron, IN - Les was born in Akron,OH and also a Highland Park (an actual park, not a city) and Nancy was born in Highland Park, MI. We found these cool street signs in Gas City, took a picture of this one for Nancy's great nephew Grant. 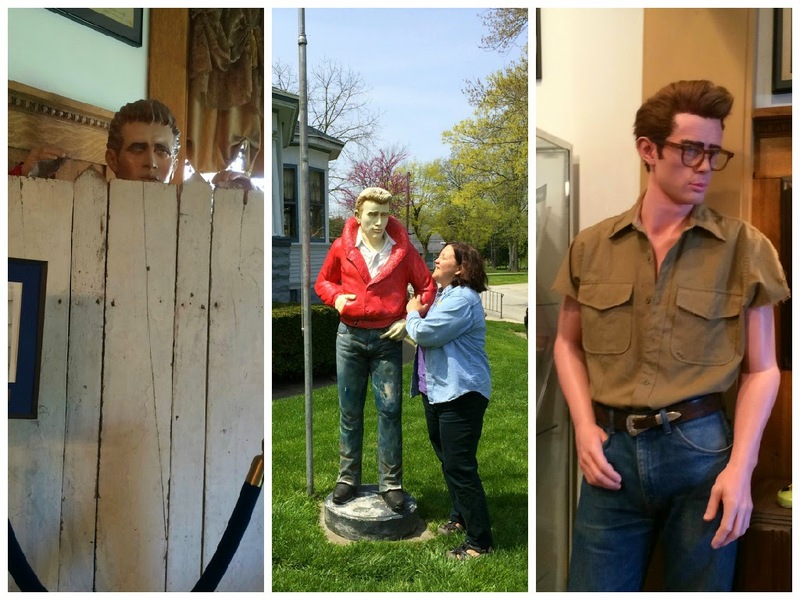 Finding all of the odd things is also a plan and Indiana didn't disappoint. A great source for this information is Road Side America. 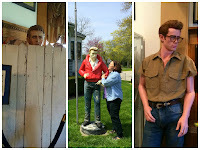 We saw the biggest stuffed steer, the largest sycamore tree stump, and an 18 foot KokoMantis in Kokomo. If you find yourself in Kokomo you have to go to the Story Book Express party store. What a cute place and the parking lot lines are wavy not straight. 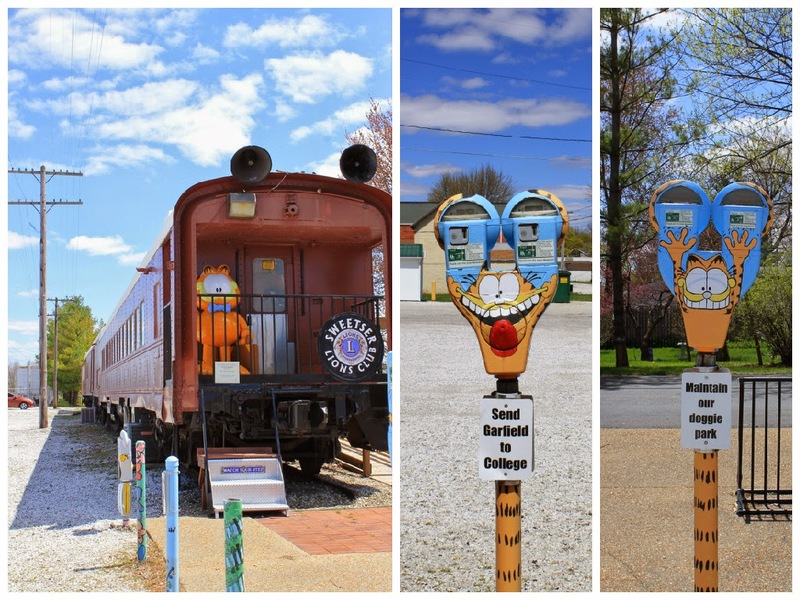 In Mentone we saw the largest egg and a rooster that must have escaped from Brookville. The best one was the biggest ball of paint. Michael Carmichael started painting this baseball over 25 years ago and now it weighs over a ton. It all started by accident in 1964 when he dropped a baseball in a can of paint and then he just kept dipping it from October 1964 to May 1966 and put 1000 layers on it. 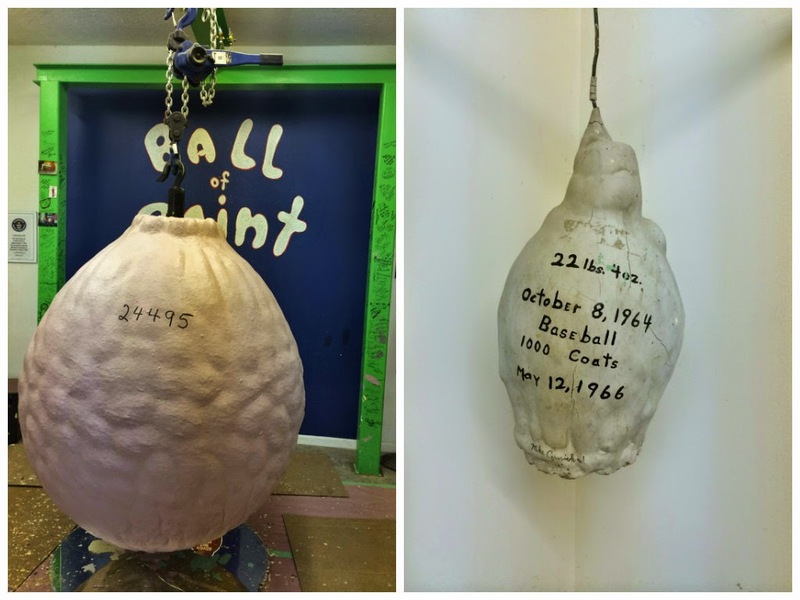 His now almost 30 year old son helped him put the first coat on the current ball when he was just 3.We got to paint the 24,496th layer of paint on it, we had no idea we were going to get to paint. It was super cheesy and super fun. Would recommend going to this one if you get a chance. Every now and then he cuts off slices which shows the different layers. 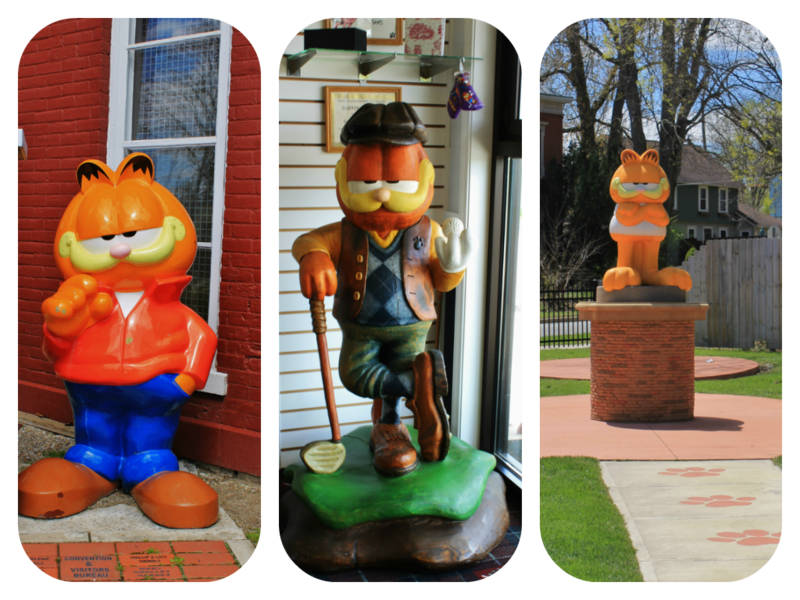 Fairmount, IN is the hometown of two famous people, James Dean, and Jim Davis, the creator of the Garfield comic strip. of memorabilia. It was interesting and he was in more movies than we realized. Nancy has never seen any of his movies so that is now on our to-do list. 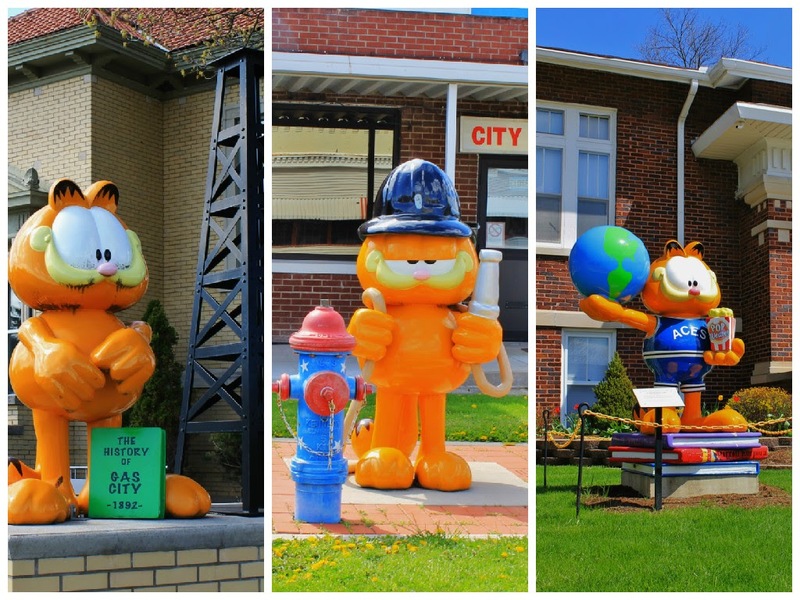 To honor their other home town hero, Fairmount and surrounding towns have put up Garfield statues, dressed to represent something from the town. 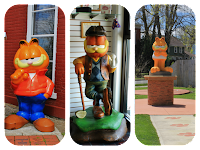 We followed the Garfield Trail, yes that is what it is called. The Glass Blower in Gas City is in front of a library and we cracked up when we noticed they spelled public with a V - PVLIC! Guess they didn't know about "U's"
The first morning, as we were getting ready to leave for the day we locked ourselves out of the RV. Luckily we had left one of the side windows open. So, we pulled a picnic table up to the side of the RV. We climbed up onto it and discovered Nancy wasn't quite tall enough to climb through the window, and the window was too small for Les to get through. So, Les boosted Nancy up and pushed her through the window. Thank goodness the couch was directly below the window because she face planted on to it. We no longer leave the RV without keys, nor do we leave the window open as it is very easy to break in! Sadly for all of you there are no pictures of this experience, Nancy is pretty happy about that fact. That's not all that happened, on our last morning as we were getting things ready to pull out, Nancy decided to make oatmeal for breakfast. Well, the previous owners changed out the microwave for a convection oven/microwave, which is great, except that when you put the stove cover up it is a very tight fit. Apparently, Nancy didn't get it in tight enough and half way through cooking it fell and sent oatmeal flying everywhere. Oh what a terrible mess it was. On the good side the floor, walls and front of the refrigerator are super clean. ~ make sure you know exactly where you are headed and verify the names of places, this will save much frustration and turning around after driving for hours. ~ if your door has a habit of locking on its own make sure you never leave without taking your keys with you. ~ make sure when you pull into your site, your fresh water tanks are full just in case something happens to the city water. ~ also make sure you have a full tank of gas just in case you need to run your generator. 30 days on the road . . .